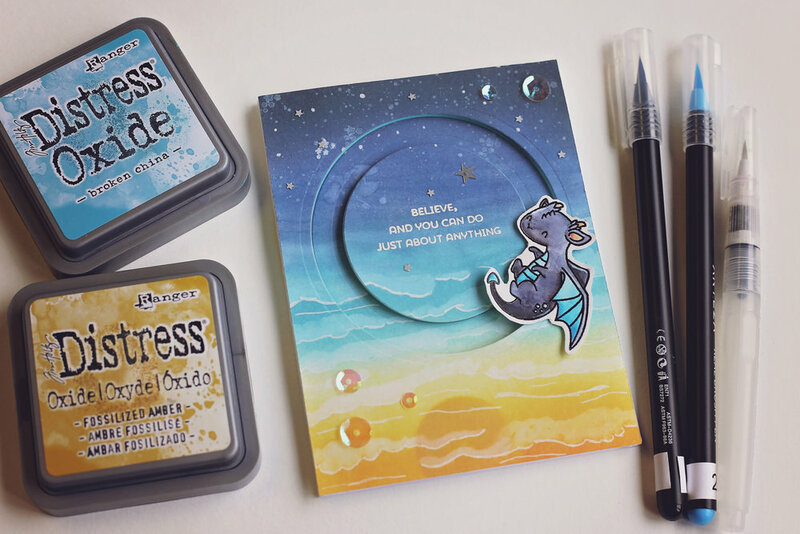 Today I created a really fun shadow box card using Distress Oxide inks, Arteza Real Brush Pens, and the Mama Elephant stamp sets "Dragon Wishes" and "Me and My Dragon." 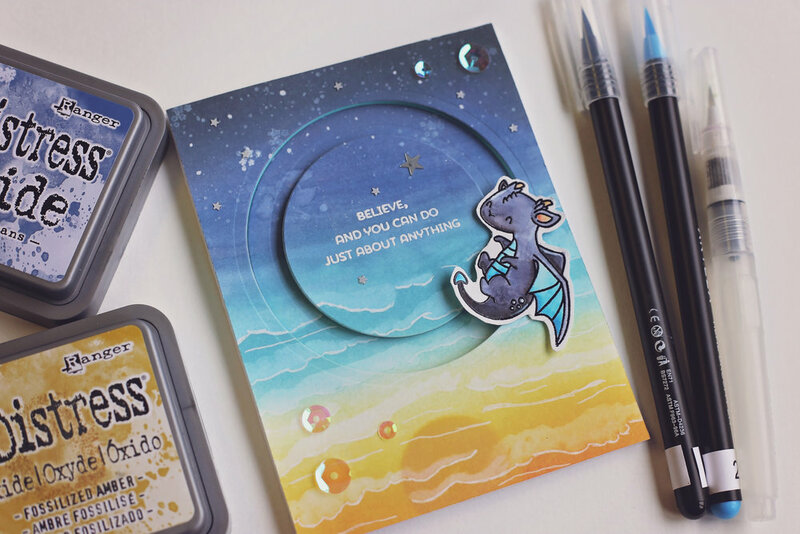 I wanted the front of this card to be very simple so all I did was stamp a sentiment that says "You Make My Life" and a little dragon from the Dragon Wishes stamp set. 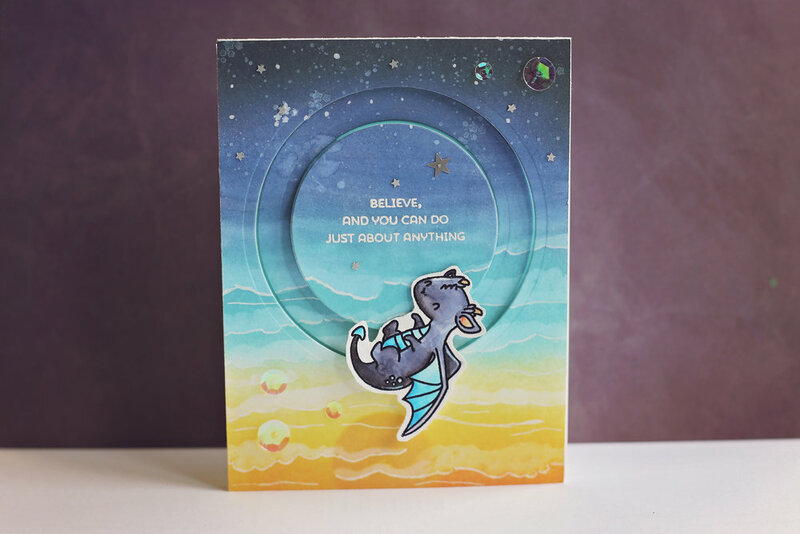 This sentiment comes from the My Favorite Things stamp set "Magical Dragons." The whole stamp reads "You Make My Life Magical" but I cut the stamp so that I could make this card. I left the dragon as just a outline, no color, and just went over him in my Wink of Stella glitter brush. So like I mentioned before, this card is a shadow bow card. 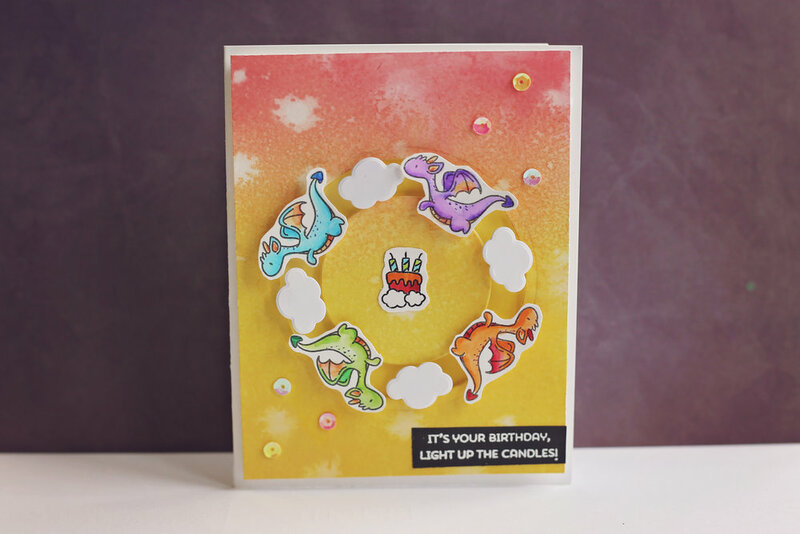 I follow the tutorial created by the amazing Jennifer McGuire in order to make this card. I could not have done this without her video! If you want to see how the shadow box comes together, check out my video below. It is kind of complicated and much easier to explain in the video! For the background of the box I created a sky with Distress Oxide ink. I took a piece of Canson watercolor paper and blended the colors Candied Apple, Abandoned Coral, Worn Lipstick, Spiced Marmalade, Broken China, Salty Ocean, and Faded Jeans. Then I used a watercolor brush with just clean water on it and paint the little clouds. I used a paper towel to soak up the water of the clouds I painted and this pulls up the ink to form the clouds. Then I used a white gel pen to outline the underside of each of these clouds. I love doing this technique. I stamped two of the dragons from the Mama Elephant stamp sets in Versamark ink so that I could emboss them with a black embossing powder. I also stamped the little girl from the "Me and My Dragon" stamp set so that it looks like she is riding the bigger dragon. I colored in these dragons with my Arteza Real Brush Pens. I glued the smaller dragon directly to the background so that it looks like he is flying far off in the distance. The larger dragon I glued to the front of the window, just putting glue on the edges of the image that touch the paper. I then used my Hero Arts Cloud nesting dies to cut three different size clouds. I glued those to the inner side of the window. This is a shadow box, so you want some elements to be forward to create those shadows. I took the rest of the sentiment, the part the says "Magical," and I heat embossed it in white on some black cardstock. I cut that down to a little strip and put it in the corner of the inside of the card. So the outside of the card reads "You Make My Life" and then you open the card to read "Magical." When I started today's card I knew I wanted to make a shaker card because I hadn't made one in a while. So when I was looking through my stamp sets for ideas I saw the Dragon Wishes stamp set from Mama Elephant and I got an idea to use all of the small dragons in it with tiny shaker windows behind them. So to start the card I cut out all of the circle shaker windows. I probably could have measured a little better to do this, but honestly I most eye-balled it, but it worked! After I had all my windows cut I cut out another square piece of cardstock and marked where all of the circles lined up onto that paper. This paper was going to become the background of all of the little windows. So using the pencil marks as a guide I added different colors of Distress Oxide ink to each of the window backgrounds. I stamped the four little dragons from the Mama Elephant set on some Bristol Smooth paper with my Simon Says Stamp Intense Black ink. I colored them in using my Arteza Real Brush Pens and my Prismacolor pencils. I popped up the little dragons with some foam tape on each of the four corner shaker windows. The sentiment that I used comes from the My Favorite Things stamp set Adorable Elephants. I made a 5.5x5.5 card base (the shaker portion is 5x5) and used a piece of black card stock to be a border around the shaker element. To finish the card I went over the sentiment strip with my Wink Of Stella. 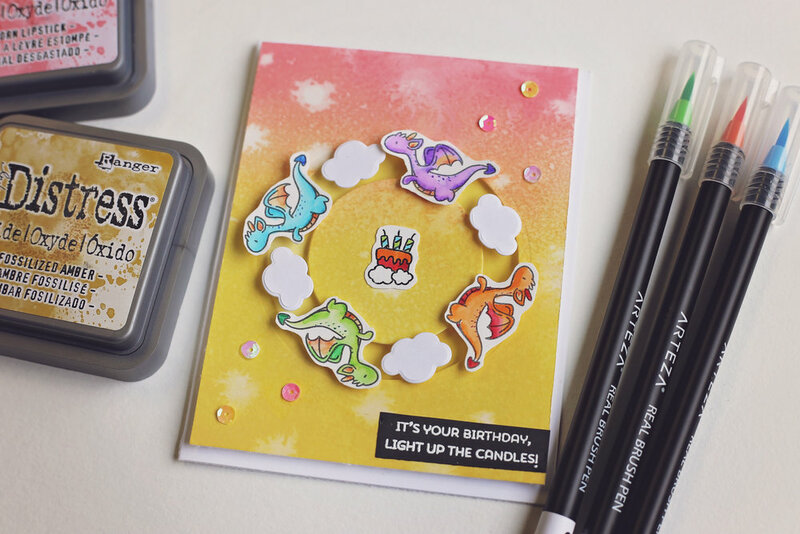 Today I have another interactive spinner card using the Mama Elephant stamp set "Dragon Wishes." This spinner card is slightly different from my last one though. The first thing I did was stamp all of my images on Bristol Smooth paper using my misti tool. The reason I used Bristol Smooth paper is because I colored in these images with my Arteza Real Brush Pens, and they work best on this kind of paper. The background is some very simple Distress Oxide blending using Fossilized Amber and Worn Lipstick. To create the spinner portion of the card I used my circle dies to die cut a ring out of the blended background. 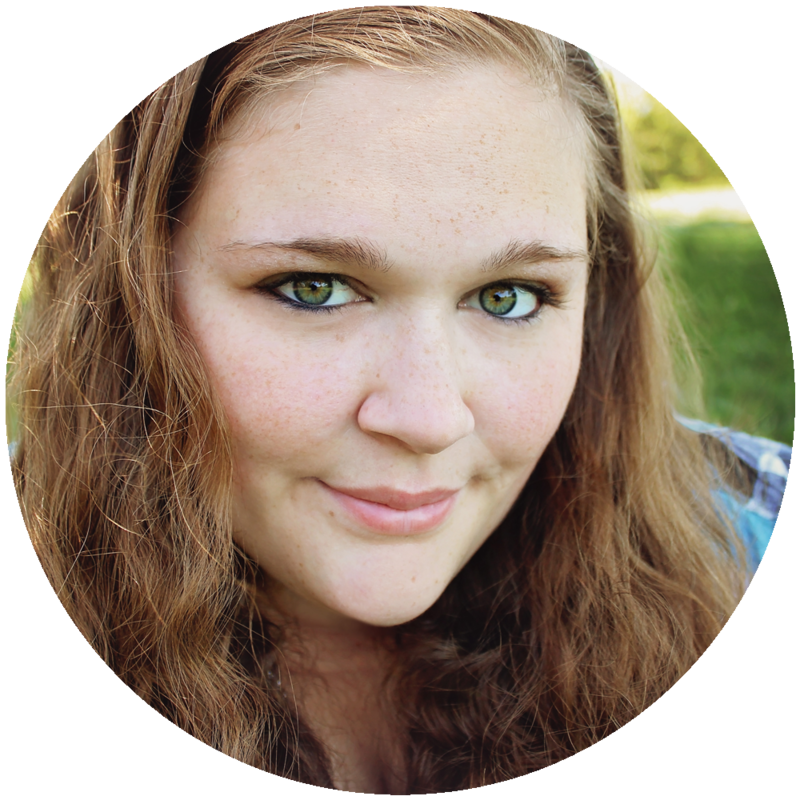 I then used the circle dies and cut out a ring in some white card stock where the inner portion of the ring was one size smaller than the inner ring on the background, and the outer portion of the ring was one size bigger than the outer ring on the background. To understand this better see the video I have posted below. I then blended some Fossilized Amber on the white ring so that it would match the background. This ring that I created is the spinner of my card, which all of the little images are glued on. So If you look at the video you can see how all the little dragons and the clouds spin and go around in a circle. I am really excited to share this card today. I really love this one! I used the Mama Elephant stamp set "Me and My Dragon" to stamp this cute little dragon. I thought that it looked like he was playing around in the air and that's how the whole idea for this spinner formed. So I stamped him in Versamark ink on Bristol Smooth paper and heat embossed in black. I then colored him in with my Arteza markers. To create the sunset background I used Distress Oxide inks. Check out the video on my YouTube channel to get a walk-through on how this background was created, it is a little complex. I cut out two circles in the background using my circle dies in order to turn this into a spinner card. The inner ring it glued to the base and the inner circle and outer part are popped up with two layers of foam tape. I used a penny to create my spinning mechanism. With a small bit of foam tape the dragon is glued to the penny and it is able to spin around the track and do somersaults. It is such a fun card! In today's cards I got to test out my brand new Distress Oxide Inks. I got a bunch of them for my birthday, and I loved them so much that I bought more online the next day. I am still waiting for all of them to arrive and I am so impatient! I can't wait to keep playing with them and learning new ways to use them. My favorite things about these inks so far is the blending. It is so easy to blend with these inks! I always struggled blending the Distress Inks. I still love those inks and will still use them, but the oxide inks blend like BUTTER! I used the Mama Elephant stamp sets "Dragon Wishes" and "Me and My Dragons" for these cards. I colored in the images with my Arteza Real Brush Pens. When I stamped the big dragon I heat embossed it in black. This made it a lot easier to color the dragon black and not lose any of the line details. I used the sequins that came in the March 2018 My Monthly Hero Kit on both of the cards. I really loved the way that both of these cards turned out. I can't wait to try out my Distress Oxide Inks again!